Have you seen this one, Reid? Tstone, bmcgilvray, PhaedrusIV and 1 others like this. I had not seen this. It looks like they went to a lot of trouble, and expense, to make this film. This behind the scenes video is giving me the impression the film will be a very good one. OD*, bmcgilvray, Sister and 1 others like this. I hope that's not all the good parts! Seriously, it does look damn good to me. Tstone, bmcgilvray, gatorbait51 and 1 others like this. I sorta knew that though it hasn't fully soaked into my pea-brain to this point. I think my brain has dried up anyway. No power of recall. I didn't realize, or had forgotten that the pistol predated the introduction of the .38 Super by a few years. 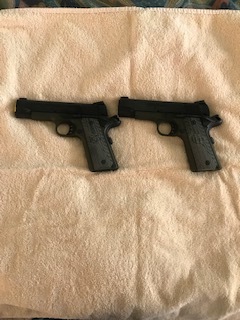 Sure don't blame Colt of the 1920s for ditching the primitive .38 Auto pistol designs for the excellent Government Model as a basis for the cartridge. The "jazzed-up" version of the cartridge was a natural for the robust automatic. Even in the face of the supposed "advantages" afforded by "improved bullet technology" applied to 9mm as well as the advent of the admittedly excellent .357 SIG, the .38 Super looks to be a genuinely first rate performer, still valid here into the second decade of the 21st century. I've long held that .38 Super (and .357 SIG) was everything the 9mm cartridge was cracked up to be, yet really wasn't. Don't think I ever knew that Colt lost the copyright to "Super .38 Auto" to United States Firearms Company. That's kinda finky, even if U. S. F. C.'s goals were laudable and they were said to produce quality products. I know "it's not business," but the rights ought to just be awarded back to Colt gratis. I love period pieces, especially that period in 20th century history in America. Gotta see that film! We really need to have a photographic thread of "guns of the era". Let's see ... what would be a good thread title? Would be instructive to have a Forum look at what is still out there and to consider how suitable the guns still can be. It's amazing to consider just how very capable so many firearms of that era really were back then ... and still are today. So many folks don't realize the effectiveness that can be brought to bear using guns from the 1900 to 1940 time period. We have not truly advanced in firearms technology as far as many think that we have. Besides, it's always fun to stick up gun photos and to see what other members have got out there. Fixin' ta' head to the range for a bit of practice before a gun show security stint this weekend so don't have time to fire up a thread just now. Tstone, OD*, PhaedrusIV and 4 others like this. Excellent idea Bryan, you should go first, I think you own an example of every gun made in that era! Qualification; do the firearms need to have actually been produce in that era, or can they be reproductions? Tstone, gatorbait51 and Rock and Glock like this. Well, it wasn't too bad, they cut out a couple good parts IMO. What does a Hotel have to do with it? TALO/Colt lightweight Commanders. Shoot great, recoil is next to nothing. Better guns than i am a shooter. OD*, PhaedrusIV, Rock and Glock and 7 others like this. 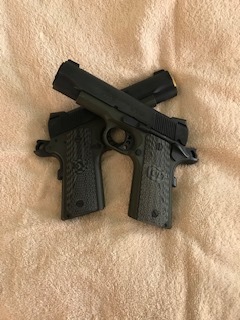 EN MI VIDA AL MAL NO TEMER…, POR QUE EN MI CORAZ”N Y MIS DOS .38 SUPER COLT. "We only want what's best for you. It's for your own good." Couple beautiful Colt's you have there amigo. Rock and Glock, Tstone, Sister and 1 others like this. Tstone, Rock and Glock, gatorbait51 and 2 others like this. Don't you go and make me take my eyes off my goal of adding a vintage Marlin Model 39 to the menagerie with your stinkin' ol' .38 Supers/Super .38s and showing your latest new acquisitions as well! Just don't ya' do it! I'm gonna have to look in the "moderator glossary of infractible offenses" to see if there is something with which to ding you for: fomenting firearms envy, inducing powerful cravings and hankerings, and spreading general discontent because a certain gun is not possessed. Otherwise known as: unauthorized tweaking of someone else's "wanter button." Tstone, OD*, Rock and Glock and 8 others like this. OD*, Pete63, bmcgilvray and 2 others like this. I do gatorbait! I do need one! OD*, airslot, gatorbait51 and 2 others like this. Just watch the movie on Netflix about Frank Hamer. Nice movie. Interesting man. OD* and gatorbait51 like this. Have you taken it for a spin yet? @Tstone , finally had the chance to get to the range and put a few rounds thru the "Hamer Special"
All I can say is, I wish I would have bought a Super, much, much sooner than I did (shoulda listened to @gatorbait51 ). Didn't put many rounds through it this trip, but next time there won't be any time constraints. Anyway, not a hiccup with either the PMC Bronze 130 grain nor the Underwood's bonded 124's at 1350fps. Mostly shooting it for function testing so was only shooting at 21 feet, but it easily chewed out the 10 ring, I'm pretty damn happy with it. Tstone, CWOUSCG, gatorbait51 and 2 others like this.